Sea urchins are remarkable organisms. They can quickly regrow damaged spines and feet. Some species also live to extraordinary old ages and — even more remarkably — do so with no signs of poor health, such as a decline in regenerative capacity or an increase in age-related mortality. These ocean Methuselahs even reproduce as if they were still youngsters. 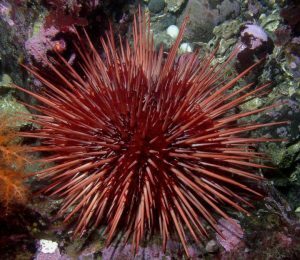 They studied regenerative capacity in three species of sea urchins with long, intermediate and short life expectancies: the red sea urchin, Mesocentrotus franciscanus, one of the world’s longest-lived organisms with a life expectancy of more than 100 years; the purple sea urchin, Strongylocentrotus purpuratus, with a life expectancy of more than 50 years; and the variegated sea urchin, Lytechinus variegatus, with a life expectancy of only four years. Coffman and other scientists working in the institution’s Kathryn W. Davis Center for Regenerative Medicine study tissue repair, regeneration and aging in a diverse range of organisms that have robust mechanisms to repair and regenerate tissue. But Bodnar and Coffman’s findings contradict that theory. They found that although the variegated sea urchin, L. variegatus, has a much lower life expectancy in the wild than the other two species they studied, it displayed no evidence of a decline in regenerative capacity with age, which suggests that senescence may not be tied to a short life expectancy in the wild.